If you’re a disgraced cricketer, accused of match-fixing and other dodgy activities and resigned to a life of ignominy, fret no more. Even if your cricketing career is over, there’s always a second chance to make it as a reality show star thanks to Jhalak Dikkhla Jaa, which seems to believe that everybody deserves a second chance. The first season had Ajay Jadeja in it. And this season has the towel-friendly lachrymally-verbose Sreesanth. The new season of Jhalak Dikhhla Jaa – no I didn’t get an aneurysm while keying in, the name really does have that many Hs and As – has begun. The premiere episode spanned two nights of over an hour each. So what’s in Jhalak Dikhhla Jaa this time around that we haven’t seen earlier? Madhuri Dixit performing in the Jhalak Dikhla Jaa premiere. The judges, for one, are the same. There’s the choreographer Remo, Madhuri Dixit and Karan Johar. All of whom shook a leg in the first episode. The less said about that the better. Everything’s a little too glitzy and gaudy this time, or maybe I’m just getting old. There are two new hosts – Ranvir Sheorey, who seems to have also been given a second lease of life on reality TV (he was in Khatron Ke Khiladi just a month back) and Drashti – who won the last season and is very easy on the eye, but seems to have difficulty reading the teleprompter. The thing with celebrity reality shows is that they always start off really well in the first season. Because that's when they get the pick of the celebrity litter. By the seventh season they’re left with celebrities who aren’t even the Snookis of Indian reality TV. This time’s contestants - in order of fame are – Palak (Kiku Sharda from Comedy Nights is taking part in the show in character and not as himself), Sukhvinder Singh (the singer of Chhaiya Chhaiya fame who also sang the BJP’s anthem this election), Sreesanth (more infamy than fame), the actor – Asish Sharma - from Rangrasiya who abducts a girl and ties her up in his jeep and then proceeds to marry her and have her fall in love with him (that’s what I get from the promo), another TV actor with an unfortunate surname - Karan Tacker, ex-VJ and sometime actor Purab Kohli, sometime singer Sophie Chowdhury, ex-VJ and current career reality star Andy (he’s taken part in 4 reality shows at last count), Akshat Singh (the cute rotund 10-year-old boy who was called on Ellen to dance), and three TV stars I’ve never seen or heard of but who might be more popular than all the others – Mouni, Kritika and Shakti. The first episode was to feature dances which were “never seen before”. So you had trapeze acts, people on harnesses, dancing in the middle of a lake, even with a hologram though not the 3D Modi one which could have been entertaining. The dances didn’t really rock my world, but then again just like the contestants who are career reality stars, I’ve become a career reality TV watcher. So I’m more jaded than others. 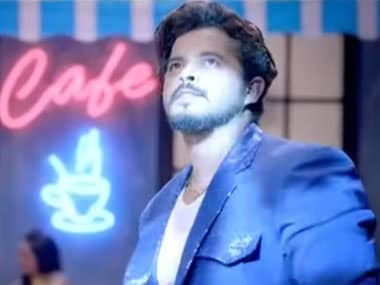 Sreesanth in the Jhalak Dikhlaa Jaa promo. Screengrab from YouTube. What I do like about Jhalak Dikhhla Jaa is that the choreographers are centre-stage here. They are considered to be as much of a celebrity as the celebrity they’re dancing with. Which is what makes it a show worth watching. The choreographers are the ones with all the talent, but always relegated to the background – so it’s nice to see them get their much-deserved moment of fame and recognition. It’s thanks to shows like Jhalak that choreographers like Salman have become celebrities in their own right. So what were the sideshows of the premiere episode? 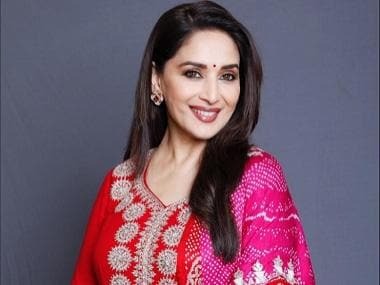 Madhuri Dixit decided to do a samba or some such which was a little heart-breaking. While it’s great to try new things, maybe it’s a better idea not to try them for the first time on national television. Gone was the grace and dignity. It was like watching Elton John gamely attempt rap. They also had two films which were promoted on the show – Humpty Sharma Ki Dulhania with Varun Dhawan and Alia Bhatt, and Holiday with Akshay Kumar (who had one pant leg rolled up to his knee for some reason) and Sonakshi. There’s also a challenger couple in the form of Lauren Gottlieb and Salman who will dance each weekend and decide the next week’s challenge for the contestants. What’s interesting to see is how Indian television is now following in the footsteps of American television. Reality television is where it’s at. And it seems celebrities (faux and otherwise) seem to be aspiring to be reality stars. Hell, that’s the only “acting” some of them seem to be doing. Only problem is that our desi Snookis (read - Rakhi Sawant and Payal Rohatgi) and desi Situations (read – Rahul Mahajan and KRK) have already been put out to pasture. So we have to make do with the second rung of Snookis and Situations. Which doesn’t make for very thrilling entertainment TV. Also, I know I sound like an old school ma’am, but shouldn’t that little 10-year-old be in school, studying? The next episode of Jhalak will be coming up against the premiere episode of another reality show. The ever-classy Splitsvilla, hosted by Sunny Leone. So next weekend is worth watching out for – the Clash of B-grade Reality TV. I simply cannot wait. My cup of jadedness will surely runneth over. Jhalak Dikhhla Jaa airs on Colors at 9pm every Saturday and Sunday night.